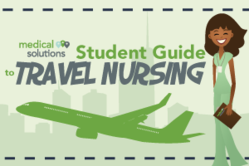 Medical Solutions, Inc., one of the nation’s leading travel nursing companies, has designed an easy-to-follow Student Guide to Travel Nursing for those interested in travel nursing as a career. We see so many of our younger social network fans wanting to become travel nurses, but aren’t sure how to start. The guide, presented in infographic form, details information on the required education, experience and necessary skills required for travel nursing. Due to the national nurse shortage resulting in high demand for nurses, travel nursing has become an increasingly intriguing career path for many nursing students. It is Medical Solutions’ goal to lead students on the correct path. “We see so many of our younger social network fans wanting to become travel nurses, but aren’t sure how to start. We wanted to point them in the right and successful direction," said Jeff Long, Marketing Manager. The student guide is currently posted on their website and is also available in a printable version. It will be presented on a number of nursing and healthcare blogs later this week. Medical Solutions, Inc. was one of the first travel nurse and allied healthcare staffing companies to be certified by the Joint Commission and has been continuously certified since 2004. Its focus is on meeting the urgent and short-term staffing needs of its clients with highly skilled allied health professionals, nurses and technologists. A nationwide network of travelers allows Medical Solutions to help its client hospitals continue to provide excellent patient care amidst a nursing and allied health shortage. Medical Solutions has contracts with nearly 1100 client hospitals nationwide and is one of the fastest growing companies in the travel nursing and allied health industry. Visit MedicalSolutions.com to learn more.